Following on from my Clarins Face Treatment Oil review, today's post looks at another mid-range brand, Origins. Origins Make A Difference Skin Rejuvenating Treatment contains Rose of Jericho, a plant which can survive and thrive after decades of drought, along with cell-reviving Trehalose from corn sugar and Sea Haricots to help treat dramatic dehydration. Dehydrated skin is a common complaint so it's a product which I'm guessing might have wide appeal. The packaging is on-brand for Origins, it's not the most exciting but it's functional. I initially thought that the simple instructions were straightforward enough but upon carrying out further research ahead of writing this post, I found that I'd actually been using the product in the wrong way for my skin type so perhaps not quite so idiot proof as I thought! During the trial, I used this as I would use a moisturiser, which is how I'd interpreted the directions. However, it turns out that it's intended to be used in a similar way to a serum- alone if you don't feel you need any further moisture or underneath moisturiser if you do. I suppose I ought to have had some clue as to this during the trial. The texture is very lightweight and although it's a product which I'd be happy to use on its own during the summer months, I found that my skin felt tight and dry by lunchtime, leaving me desperate to apply moisturiser. 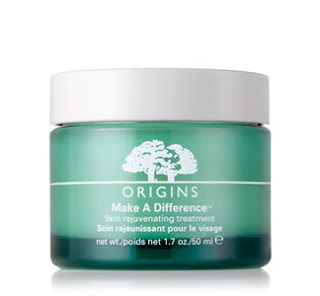 Origins Make A Difference Skin Rejuvenating Treatment has a light, peachy scent which isn't sickly- I really liked it. I have to say that I didn't notice any rejuvenating effects and although I'll revisit this product again in future, it hasn't wowed me in the same way that other serums and skin treatments have.